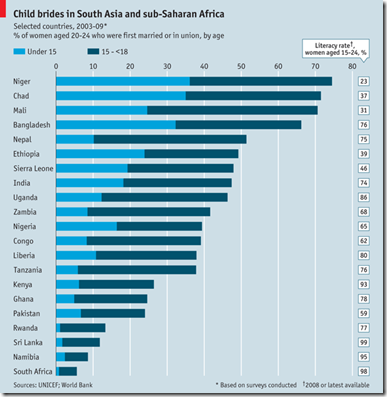 In some parts of the world, marrying young is commonplace. I couldn’t find the exact comparison for the United States, but the median age when married is 26 (2009). Wikipedia lists data for additional countries, if you’re interested. Horrible. And then, usually, the groom is picked by the parents, and is way older than the girl. Horrible. The legal age to marry changes over time. I think we will see a movement toward reducing the age in the USA as media like Disney and Hanna Montana commodify girls bodies and appearances. An interesting comparison would also be looking at when women had their first child. I know after two years in Namibia that marriage just wasnt the norm for a lot of girls that age but pregnancy was a huge issue.